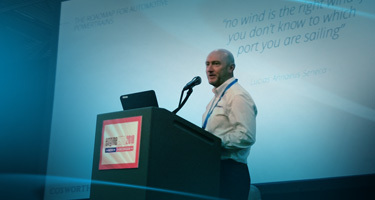 “No wind is the right wind if you don’t know to which port you are sailing.” It was with this quote that our Commercial Director, Powertrain Chris Willoughby began his presentation at this year’s Engine Expo event in Michigan, outlining Cosworth’s vision for powertrain development. Electric vehicles were again a hotly debated topic at the annual US expo, a must-attend event for powertrain specialists situated just over one hour away from Cosworth’s recently inaugurated North American Headquarters. With sales of pure electric vehicles still in the low percentages across Europe, and still largely the domain of luxury vehicle manufacturers, Cosworth used Engine Expo to reaffirm its approach to the powertrain of tomorrow. While ICE and EV are often discussed as competitors in the powertrain market, both solutions have existed for well over one hundred years. Looking back down history, the EV solution actually paved the way for some time. “The main issue we face,” continued Chris, “is that we expect the population to rapidly adopt EV technology, but it currently comes with too many drawbacks for the individual: History suggests new technologies are only widely adopted when they bring significant benefits to the end user. We must not lose focus on providing solutions that are both environmentally beneficial and an improvement to the end user”. Across the broad spectrum of intermediate solutions, Cosworth has invested its efforts in those involving retention of the ICE, but with a focus on improving emissions and cost-effectiveness. In order to achieve this Cosworth has adopted manufacturing techniques such as plasma coating, but it is the variable valve lift solution that yields significant benefits. Cosworth has developed a system for an international OEM partner using the solution, which promises to offer exceptional results. Looking further into the future, Cosworth has also been working with Camcon – a fully variable valvetrain system that enables completely independent control of each valve in the cylinder head. Although still a work in progress, Cosworth continues to underline its clean sheet road-going powertrain engineering credentials with a pioneering yet pragmatic approach to next generation powertrains.